Invicta’s Subaqua Collection is most well-known for being the “best under pressure”, with each watch in the collection able to withstand underwater pressures of up to 500 meters. 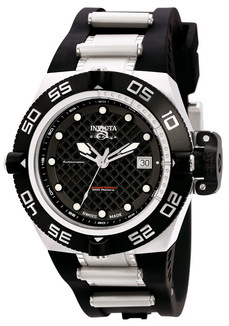 The Invicta Men’s Midsize Subaqua Noma IV Automatic Black Polyurethane Quartz Watch 0522 is no exception. One of the unique features of the Subaqua Noma IV Automatic is the battery-free function, which is made possible by the watch’s ability to power itself through the movement of your arm. The black strap with the buckle clasp keeps this watch firmly attached to your arm at all times for easy access and security. The watch has no numerical markings apart from the date function, which sits at the 3 o’clock position. Like all pieces in the Subaqua Collection, this timepiece is specially designed to be both water and shock resistant, making it ideal for active men engaging in extreme underwater activities such as diving. While the dark design of the Subaqua Noma IV Automatic is sleek and masculine, the lack of contrast between the black dial and the gunmetal-gray hands and hour markers may make this watch difficult to read for those with less than perfect vision. 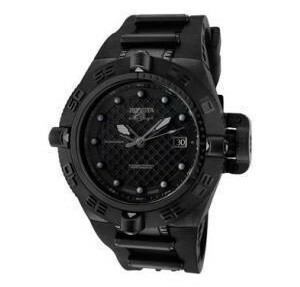 For men looking for something with more contrast, the Subaqua Noma IV Automatic 0521 may be a better option, due to its black and white face. You lose none of the great Subaqua features, and gain visibility and ease of use. This black-and-white model may offer easier visibility for the near-sighted man.